Verandas and balconies with unlimited view towards the sea or the mountains, modern comforts and services, family and hospitable environment. 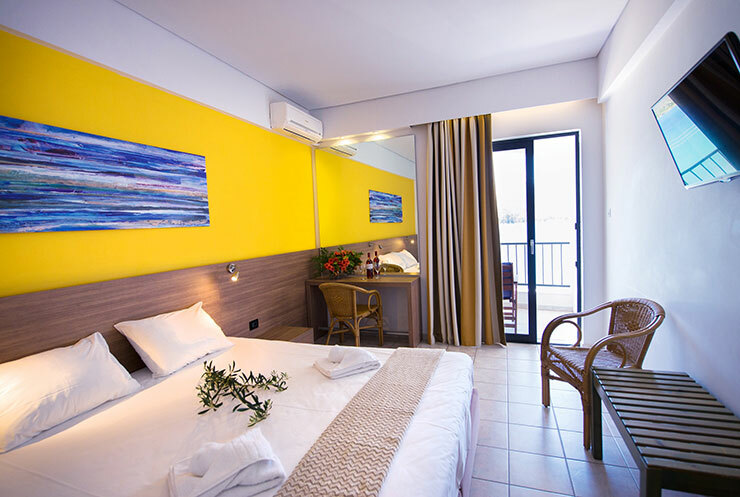 "Pavlou Hotel" is a modern and sophisticated hotel, situated in "Neorio" location, in front of the sea, thus having amazing sea views from its balconies and verandas. The area is idyllic, full of green and is ideal for moonlight nights next to the beach. 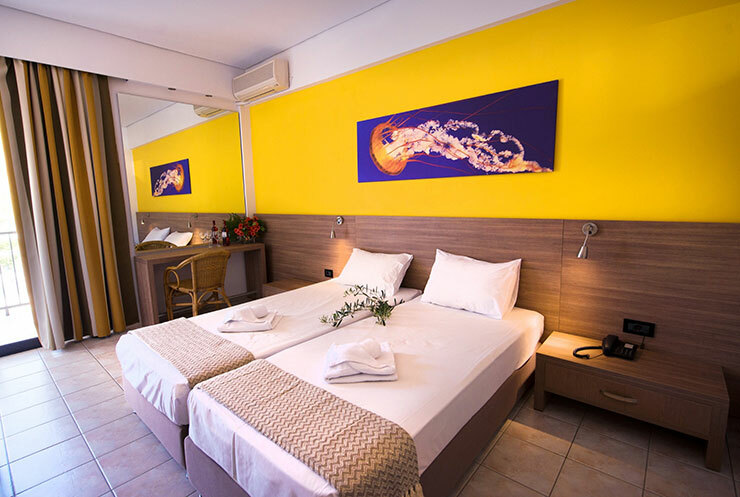 The hotel offers all the modern comforts, emphasizing to the creation of a familiar atmosphere to its quests, retaining its family and hospitable character. 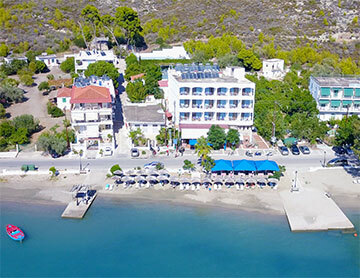 The hotel offers all the modern comforts, luxury, quietness, verandas and balconies with amazing and unlimited view towards the sea or the mountains. 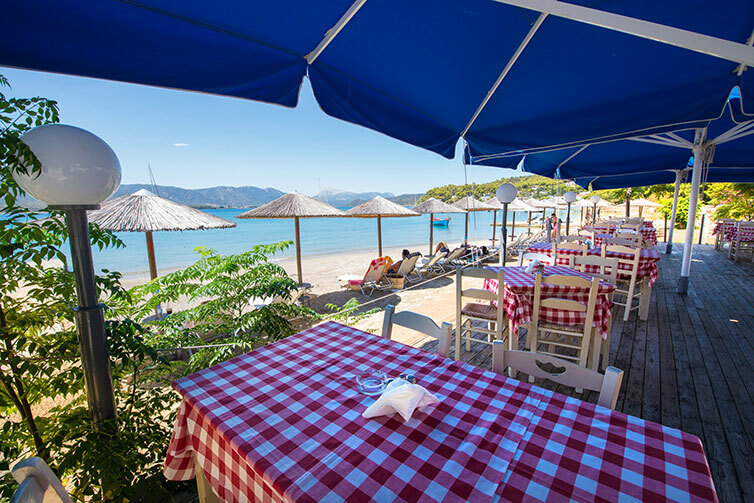 The hotel has a bar-cafe, a quality restaurant with tables in front if the sea and an organised beach with umbrellas, sun decks and small tables. These rooms are double, spacious, with all the modern comforts and nicely decorated and furnished. They have balcony with a table and chairs with panoramic view to the sea or the mountain. 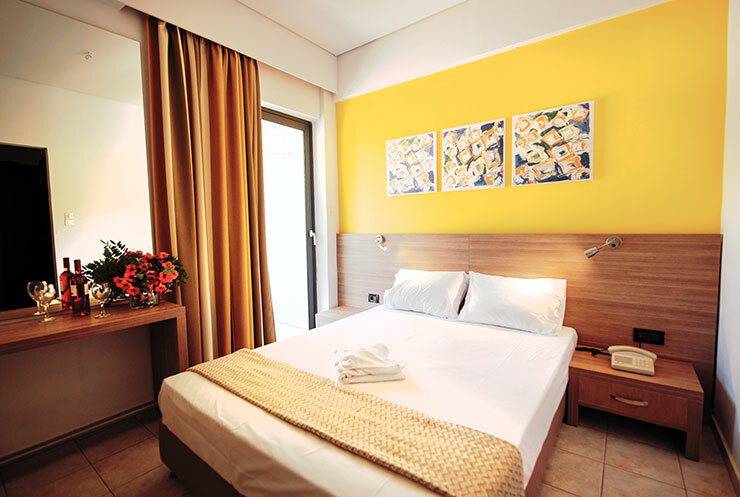 These rooms are triple, spacious, with all the modern comforts and nicely decorated and furnished. They have balcony with a table and chairs with panoramic view to the sea or the mountain. There are apartments with 2 bedrooms, which can accommodate from 4 to 6 guests. They have got all the modern comforts, also balcony with table and chairs with view to the surrounding area. "Pavlou" Hotel is located in an adyllic location in front of the sea, surrounded by pine trees and greenery. If you have planned your wedding in Poros, then Pavlou hotel is the ideal solution for you and your quests. We have got a beautiful reception hall that can accommodate approximately 200 guests, ideal for wedding receptions. Come and organise with us your most happy and importand moments of your life. Poros is a beautiful island to get married. For your wedding there is also very close to our Hotel the small church of Virgin Mary (Panagitsas). It is located on the small islet of Daskalio, next to Poros island. You can go there with decorated boats, from the pier of our Hotel. 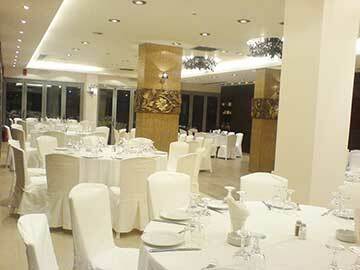 "Pavlou" Hotel is located in an adyllic location in front of the sea, surrounded by pine trees and greenery. 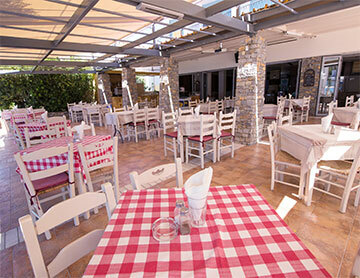 If you have planned your child's baptism in Poros, then Pavlou hotel is the ideal solution for you and your quests. It is an ideal place to organize the reception of your child's baptism, since apart from our Hotel, we also have a very nice reception hall that can accommodate up to 200 guests or even an outdoor place, in front of the sea, suitable for this purpose. For your baptism there is also very close to our Hotel the small church of Virgin Mary (Panagitsas). It is located on the small islet of Daskalio, next to Poros island. You can go there with small boats, from the pier of our Hotel. "Pavlou" Hotel is located in an adyllic location in front of the sea, surrounded by pine trees and greenery. Our Hotel and Restaurant are suitable for organizing corporate meetings or for any other major event, like your club, your business and any other such event. Our many years of experience, excellent service, the wide variety of menus that can satisfy even the most demanding guest, friendly and experienced staff, as well as our "good" prices, guarantee for the success of your event. At our Restaurant we are waiting for you to enjoy our wonderful menu, in a pleasant place, in front of the sea. We start early in the morning serving breakfast and continue at noon until late at night. In front of our Hotel there is an organized sandy beach with sun loungers and umbrellas where you can enjoy the sun and the various sea games. 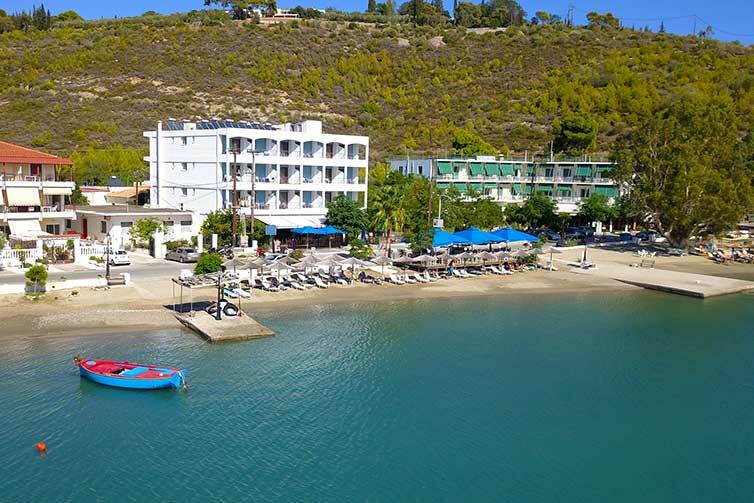 COASTAL HOTEL IN ONE OF THE MOST BEAUTIFUL BEACHES ON THE ISLAND, TO THE EVER GREEN NEORIO AREA OF POROS. We are waiting for you to offer you a vacation that will keep you unforgettable!